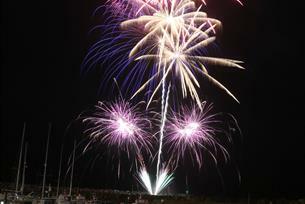 Summer fireworks display in seaside town of Portstewart to conclude the Red Sails Festival. The Red Sails Festival is a week long festival featuring a variety of free entertainment and workshops organised by Portstewart Community Association. The festival concludes with a magnificent fireworks finale organised by the Council Events Team at The Crescent, Portstewart.